This will be a compilation list of the most common known, important 2012+ / Mk.III NA Focus performance aftermarket parts. Listed here are parts either specified by the manufacturer for our specific application, or as also applying to the 2012+ Focus. This is not a list of parts from the older Focus that fit. That thread can be found here. This list is possibly incomplete (I don't know everything! PM me or reply to thread with spots). All Tirerack links retrieved through our Upgrade Garage portal in the wheels/tires section of FF. I've tried to include some links to threads with info regarding some of the mods. Remember, new folks, SEARCH IS YOUR FRIEND. Also, before you do anything to your car, read up on the Magnuson-Moss Warranty Act. For your warranty claim to be denied or voided, your dealer/service dept. has to prove that the part caused the failure. Bear that in mind. I'm not going to tell you whether or not you should mod your car, whether or not you should mod a leased car, etc. That's a discussion for elsewhere. However, take it with a grain of salt other peoples' experiences of modifying a car and then going back to stock when something goes wrong. If your dealership finds out and leaves you out in the cold--that will be on you, and not them. This includes flashing new maps to the ECU, and they can find that information out rather easily. Do your research, assess the risks vs. benefits, and make your own decision. Use all due diligence as appropriate. There is now tuning., but Check both [Here - SCT tuning release thread] and HERE [The Injected Engineering thread] for updates and HERE [The Tuning Poll]. FSWERKS is currently in the midst of testing with the SCT software, so expect something from them soon. They are currently testing work with the Mk3. If you want a device from them, get in touch with Randy from FSWERKS (You need to know your ECU Strategy code, which can be found on the ECU itself or read through OBD-II). At present, you can obtain tuning for the 2012+ Focus (Manual only), off the shelf, by updating the firmware of an X3, as per the SCT site. Details for support for other hardware are forthcoming from them. Awaiting details for sales of pre-loaded flashers with 2012+ tuning options. Also, as of Mid-June, Injected Engineering now has a tuning solution for both 5-Speed & DCT equipped vehicles. If you have an X3 with the updated software and are local to an authorized/experienced SCT tuning shop, you can likely get a custom dyno tune there. Your mileage may and will vary. COBB Tuning's AccessPort is only for the Ecoboost-equipped ST. Believe it or not, we have a lot of suspension options. Remember that if you go lower, you will need to adjust your alignment. If you go low with just springs, you will wear your stock shocks faster. As of yet there's only scant reports of stand-alone shocks for the 2012+ Focus. That'll probably change soon. FSWERKS & Tirerack both sell camber bolts and alignment supplies. Also, account for your wheels or planned wheel size when messing with lowering. Please go to the Suspension Subforum for more suspension info. :) Also, you can find some very basic information about the importance of wheel alignment here. A brief note on Mk.3 Suspension: Doubtless you may know by now that the 2012+ Focus came in three suspension variations. The base suspension, the sport suspension, and the Titanium Handling Package. As far as I know, the Ford Racing Performance handling kit is nearly the same if not identical to the Handling Package minus the steering angle block. The SE Sport suspension is labled on ETIS as the 'touring suspension', which a few of us have narrowed down to different shocks and springs than the base, but not the same as the THP. There may be some parts commonality. But it is not the same as the stock suspension, and it's reflected in the SE Sport pack ride height. We believe the dampers/shocks/struts to be the same as the THP, but with softer springs. If you have some additional info, please PM me. James Barone Racing Rear Swaybar kit (red and black avail). The H&Rs and KW V1s are not adjustable for dampening. They are height-adjustable only. They're tuned from the factory for the best compromise. (Need more KSport retailers; KSport only in the last couple of weeks confirmed fitment; they make 4 models for the Focus; Kontrol Pro, Spec AR, Circuit Pro, and Version RR. Only found the first two with pricing). (Also, if you know some more KW retailers with pricing for V1-V3, please message/reply here). One thread with some coilover experiences/info [Here.] Also, from what I have heard on several other car communities, the D2 and KSport coilovers are largely the same unit and are fabricated in the same place and marketed under different brands by region. Di with that info what you like. Here's some information on peoples' experiences with the VMaxx Coilovers [Thanks, Dyno085]. Dyno Comparison Thread [here; FJ], Steeda CAI Review/Info [here], K&N Typhoon info/disc. [here]. Also, [Here]. FSWERKS Cool-Flo intake install, pics, discussion [here.] Intake AND Exhaust thread (FSWERKS) [Here.] Don't forget to visit the Mk.3 Focus DYNO THREAD. Some of these intakes do not relocate the air filter; like the Steeda CAI, some do. Be sure you know which you're getting. You will need to do either the snorkel delete or the Newmission mod (see above) to see any real gains from these. Gains seem to be in general 0-4whp. These mount to the MAF collar of your stock airbox just like OE. Please be sure to care for these only how the manufacturer tells you and do not exchange methods. You could damage your filter. Info: You have several options. FSWERKS (they make 2 versions, both have the same performance), Borla, Magnaflow, and custom. 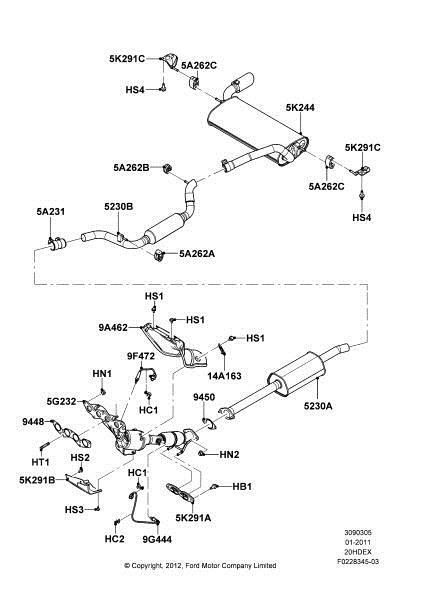 2012 Focus Exhaust Info Thread [Here] The 'Header' Thread - There are no officially-acknowledged 2012 headers, but others have successfully fitted old ones. [Look HERE] - Please do not post here about header fitment until we have an official 2012 application header; there are other threads for that. Some experiences with the FSWERKS Stealth unit 'burn in' [Here]. FSWERKS Race system info/experiences [Here]. Please be aware that fitment is different for the hatch and the sedan. These will give you a mild boost in performance. 2.25 inch will give you less of a bump in whp/tq than 2.5-inch, generally speaking. If you're going for the absolute stealthiest setup, many say the Magnaflow is the most quiet. Rebel Devil Customs 2.5 inch Catback Exhaust Systems for 2012+ Ford Focus Track, Street, and Sleeper versions from the same link. For getting some livelier sound only. SPEC now makes clutches for our cars (MTX75 5-speed manual transmission), ranging from Stage 1 to Stage 5. Consult their application chart here. Thread Pitch for shifter: 12x1.25. Shift Knob Removal-How To thread HERE.. Steeda Short Throw shifter kit installation thread [Here]. Please note that for the maximum throw reduction, you need to install the transmission bracket as well. You will also need to modify parts of the dash trim (detailed in threads). There are no aftermarket clutches yet. Exedy is reportedly working on an OE replacement, and then may do additional, higher-spec stuff. Watch this space. Steeda Autosport Tri-Ax Short Throw w. Transmission bracket. Bear in mind that the Focus Electric and Mazdaspeed3 mounts retrofit onto our cars as well. You may have to play around with inserts to achieve the desired amount of stiffening without harshness, as well as bolt/screw size. The MS3 & ST mounts are essentially interchangeable. Good discussion on RMMs [here]. The Focus Electric RMM part is #CM5Z-6068-A ; The stock MS3 mount is BBN5-39-040 and requires the bolt #9YAO-2A-226A. Both can be ordered through your local Mazda dealership. This will more than likely cause Ford or your Ford Dealer to void your warranty or deny a warranty claim, because it may be considered 'modifying engine internals'. Your oil system is a critical part of your engine's support systems. If you're not entirely sure it's a good idea, or that you can't handle the install...don't do it. (Refer to the top of the page about the MMWA) However, some of these modifications can possibly extend engine life as well as allow for longer oil change intervals (OCI). Pair the mods with a good Used Oil Analysis service. For a full discussion about your oil, and oil system, go [here]. Oil System Bypass Filtration set-up. - Will also expand oil capacity from 4.5 to 7 qts. Please remember to mod responsibly! I think that's it for the time being. I will edit this post with whatever new that comes up. Hopefully that will be tuning. If you know of something that should be on here, please say so! aperson9923, akcollins88, Drogori and 3 others like this. Last edited by RedComet; 02-01-2014 at 03:35 PM. Great info so I made it a sticky so everyone can see it. With two small tweaks a cut (so it would come off of the car without removing the rear suspension) factory stock ST exhaust bolts right up and tucks into the exhaust tunnel just like the stock exhaust, but gives you the 2.5" OD piping and center exit exhaust. Thank you Red Comet. Great job organizing this. Suss, do you have an install thread for the ST exhaust? I know you've done the mod, but I didn't include it because it wasn't application-specific. If you read the post carefully you will see that I have a link to both major threads about the MS3 and Focus Electric mounts, as well as that this thread is designed primarily for parts designed to work on our car. The ST mounts on the list are also confirmed application for the NA 2012+ Focus. However, I've edited the description/info section on the motor mounts with the part numbers so those looking for them can find them more easily. It may be worth linking to the MS3 spring install then too. Suspension: MS3 Springs, Focus electric RMM. I didn't manage to get any pictures while they were cutting and welding the tubing back together, but it really isn't that complicated. I'm sure I could adequately illustrate it with a few pictures. Basically the only real modification was to cut the tube directly after the cat flange and rotate the resonator and piping about 45 degrees as the flange is rotated on the ST compared to the N/A. Otherwise it was stitched back together where it was cut in at the rear section and buttoned up. I asked them to put the tube sections to weld it back together on the outside as to not restrict flow, I'd have to get it back on the lift to check 100% if that's what they had done, but it doesn't seem too restrictive. Does anyone know if the Steeda rear mount will fit a non ST focus?